7.30am, 10th January 2018. The Arts Centre foyer contained a small number of yawning, heavy-eyed teenagers, barely awake, yet enthused by the prospect of the day that lay ahead. The buzz of chatter and excitement in the air grew as more drama students entered the foyer, finding their friends. A music-filled bus ride to London later and we strolled into Covent Garden which was still beautifully decorated for the festive season. 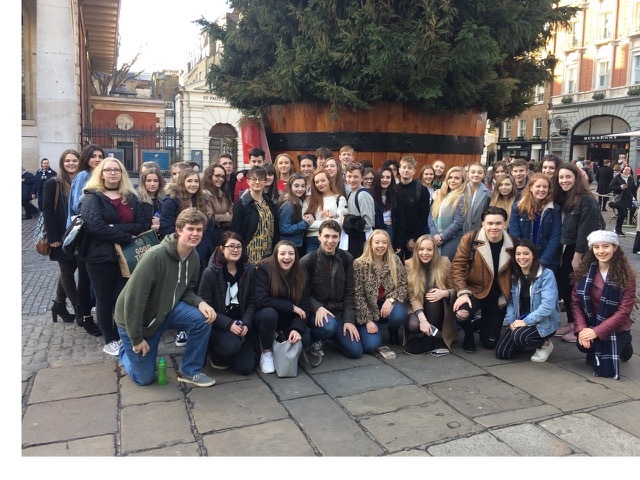 After lunch, and some time watching the street theatre on offer, we headed off to the Cambridge Theatre, the home of Matilda the Musical. Every single person in the auditorium was eager and filled to the brim with anticipation at the first sign of the rising curtain. Those of us who had been before were speculating on our favourite parts, others sat stunned by the magic and beauty of the bright, bold set before us. Then the moment we had all been waiting for arrived: the lights dimmed, the audience fell silent, the show began. As we streamed out of the theatre into the cold January air, all that was discussed was the awesome show we had just seen. From the stunning talent of the young actors and actresses to the hilarity of Miss Trunchbull and Rudolpho, there was something for everyone to fall in love with in this wonderful musical. We headed back to the bus after our exciting afternoon, sad to be leaving the sensational city in which we had spent the day. Even more laughs were shared on the way back to school, songs were sung and games played – as is traditional on all drama trips. Overall, the trip was a spectacular array of colour, sound and talent, one of which none of us will be forgetting any time soon. Just as every other show we see, this one had a lasting effect. The theatre will continue to move, encourage and inspire us, not only as students, but as people.